Ily Reiling received her BFA in 2012 from the Metropolitan State University of Denver and her MA from the University of Denver in 2016. Reiling’s artwork embodies the observations of a contemporary absurdist; investigating narratives, archetypes, and myths. Her work has shown in Ireland, New York, California, Arizona, and Colorado. Reiling has been instructing studio and art history for over 10 years. 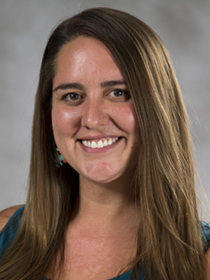 Her research in education focuses on Visual Art’s ability to initiate environmental change in rural settings, specifically for underrepresented populations. She has worked as a curator, marketing consultant, fundraiser, and artist advocate for various institutions over the past 7 years. She has received 3 residencies in Colorado and New Mexico. She currently holds the title of Director of the Trinidad Chalk Art Festival, Board Member of the Artocade, Board Member of the Pinterarium Art Lab, and the Educational Program Director for Cartopia. Reiling continues to expand her knowledge, skill set, and art in order to benefit her students, her audience, and her communities.